My mom always says, “A simple menu is a recipe for success.” She’s right, and that couldn’t be closer to the truth at F. Ottomanelli Burgers and Belgian Fries, where, as owner Frank Ottomanelli puts it, “we have a small menu so we can bring the freshest ingredients to our customers.” Surely, they’ve succeeded. And it’s not just the fresh ingredients that will keep customers coming back for more. It’s the gracious hospitality with which customers are met. While we were enjoying our burgers, Frank came over to my dining partner and I and asked if we had tried the special sauces for the fries (I’ll get to them later). 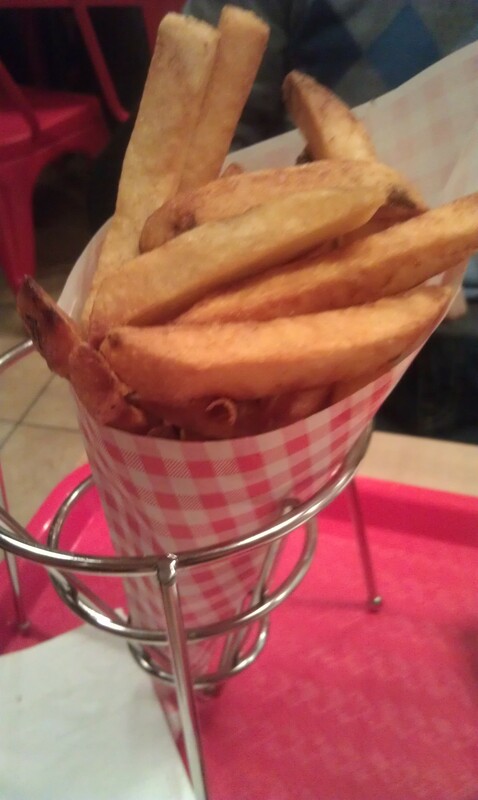 We hadn’t, so he decided to bring them over to us … with an order of freshly prepared fries. You simply don’t get that kind of service at most places. As part of a butcher dynasty, F. Ottomanelli is practically neighbors with its meat supplier, S. Ottomanelli and Sons, a Woodside institution. “The meat is always fresh. We grind it at the butcher store,” Frank says. “Our goal is to sell all the ingredients by the end of the day so that we can start fresh the next day,” he continues. At this rate, they’re bound to do just that. I’ll break down the burgers and fries for you, part by part, so that you can have the best idea possible of what to expect from F. Ottomanelli. The meat: It was nothing less than completely juicy and delectable. I wouldn’t say it’s the most flavorful hamburger I’ve had (Shake Shack is the gold standard in this category), but it’s a burger I’ll likely crave at some point. 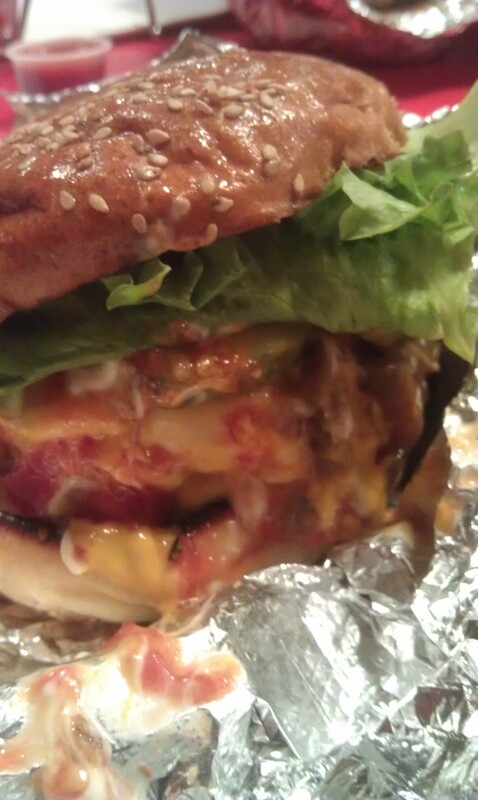 And, as one of the only true burger joints in the area, it’s inevitable that I’ll return for that juicy patty. The bun: Big and puffy, as my dining partner said, but definitely delicious, the bun adds something to the burger; it isn’t an afterthought. My only concern is that the bun might seem like too much bread to those ordering the “junior” (or single patty) burger. Am I wrong? Tell me, if so. The toppings: Here’s where I have a gripe. I ordered mustard, mayo and grilled onions to top my burger. (The burgers come standardized with lettuce, tomato, and ketchup.) I felt that there could have been more toppings to go around. What the Shake Shack and Burger Garage seem to do best is they distribute a large amount of toppings for the double burgers. I felt that Ottomanelli’s double burger received as much toppings as a single might have. Lay it on, I say! I’d rather use a knife to remove some of the toppings than feel I have a dry burger. In other news, if you order, say, a caramelized onion burger, apparently, Ottomanelli will mix in the caramelized onion with your beef and serve up a patty with the onions embedded in it. I’ll definitely try this next time I go. The Belgian fries: Cubic and beam-like, the Belgian fries are certainly a notable part of the menu. The quality of the potatoes shows through, and their freshness is definitely an enjoyable element of the fries experience. The fries sauces: The ones I liked best were the creamy and cheesy Rosemary Parmesan, the flavor-that’s-hard-to-place European Mayo, and spicy Chipotle. There was also Malt Vinegar, Buffalo Sauce, and Hot Sauce, which I don’t care for, but MDP enjoyed the MV. I highly recommend the sauces, so be sure to ask for them when you go. The service: Excellent. I think I rankled the nerves of the woman who was taking my order, but ultimately, the service was fantastic. Frank came over to our table, beaming as he talked about the new restaurant and all the press it’s already getting (Time Out New York is going to feature F. Ottomanelli in an upcoming issue!). I appreciated his time and his words. To Ottomanelli: Please put up a website soon. Don’t let your customers rely on the totally unreliable Yelp to find and enjoy your place!